Two of our Curious Creators have been accepted into the latest intake at the prestigious Australian Film, Television and Radio School (AFTRS). Adam McPhilbin and Dani Sitto will begin the AFTRS Diploma in Camera Fundamentals later this month, which is highly regarded by the industry as a foundation for future cinematographers and visual storytellers. Both had an impressive portfolio of work to add to their applications after developing through our Curious Creators trainee program for Western Sydney’s next generation of artists and community cultural leaders. They could boast production credits on our feature film Riz and several other CuriousWorks productions, including key photography roles on the Riz spin-off music videos. With the skills they gained, both have gone on to earn income from client-commissioned videos offered to CuriousWorks. Dani, 17, who only arrived in Australia as an Iraqi refugee in late 2012, is also supporting himself with regular work as a wedding video producer (when not creating quirky short videos to build his YouTube following). 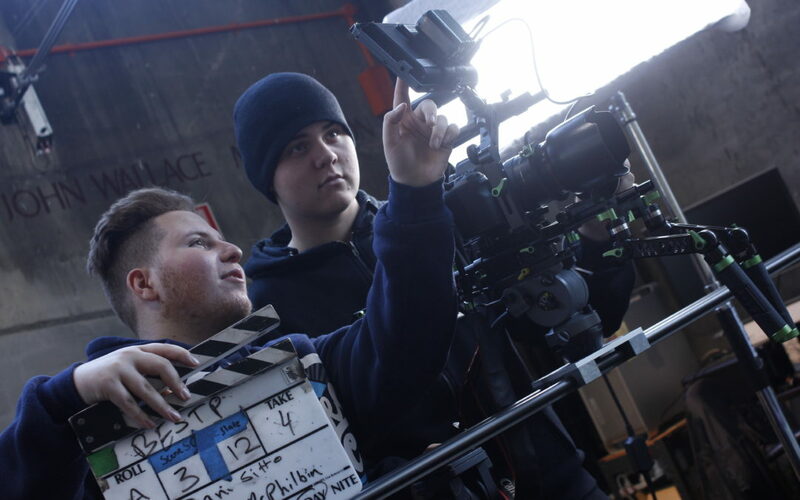 Adam, 20, first got involved with CuriousWorks when he was still at high school and ultimately aims to become a filmmaker who “creates visually-stunning films that make people think”. Dani described the AFTRS opportunity as “a springboard towards my ambition of becoming a professional director of photography, film director and social media influencer”. Congratulations guys! We look forward to putting your new skills from this experience to good use on future CuriousWorks projects.